Yusuf was arrested six months ago on charges of stone pelting, while he was only fulfilling his duty as a journalist. After around 20 hearings, the Kashmiri photojournalist Kamran Yusuf was finally granted bail today by Additional Sessions judge Tarun Saharawat in the NIA Special Court in Delhi. Yusuf will be released on the condition of furnishing two sureties of Rs 50,000 each, one of which has to be local. While he cannot travel outside the country, he will not be bound to remain within the jurisdiction of Delhi. The detailed bail order will come out on Tuesday. Yusuf was arrested on charges of stone pelting on September 4 last year as a part of a larger terror funding case being fought by the National Investigation Agency (NIA). NIA filed an FIR in the Jammu and Kashmir terror funding case on May 30, but took over six months in filing a chargesheet. Despite the time taken, the agency did not produce any strong evidence against Yusuf in the chargesheet. Yusuf’s mother and grandfather came to Delhi last week to meet Yusuf for the first time since his arrest. Rubina, Yusuf’s mother, told Newsclick that the family kept telling Kamran to not get involved in this work as it is dangerous. Kamran, however, persisted and has been commended for his extensive coverage of the Kashmir conflict. NIA has cited Yusuf’s presence at sites of stone pelting incidents as evidence of his guilt. However, his presence alone can be justified by the fact that he was taking pictures of the incidents as part of his work as a photojournalist. The NIA has not been satisfied with Yusuf’s work. 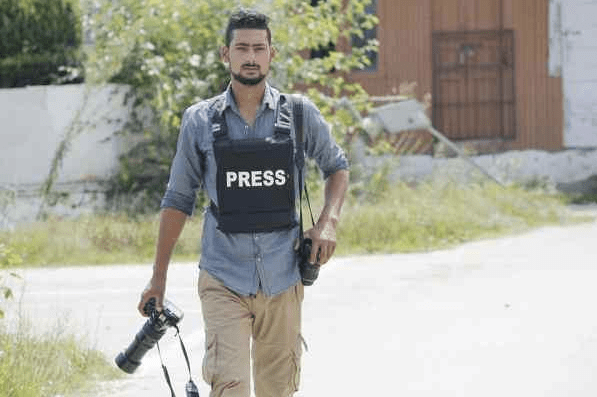 In the chargesheet, the investigative agency has claimed that Yusuf was not a bona fide journalist as he did not cover any developmental work being done by the government. “He had never covered any developmental activity of any Government Department/Agency, any inauguration of Hospital, School Building, Road, Bridge, statement of political party in power or any other social/developmental activity by state government or Govt of India,” the chargesheet says. The NIA chargesheet also states that Kashmiri media is equally responsible for spreading unrest in the valley. Apart from the inadequate chargesheet, the NIA has also been making repeated attempts to delay the orders in the matter by presenting additional documents to the judge after filing of the chargesheet. These documents were not filed as a part of any supplementary chargesheet. Yusuf’s arrest has been condemned by international journalist groups. Yesterday, J&K Chief Minister Mehbooba Mufti tweeted that she has asked Home Minister Rajnath Singh to look into the matter of Yusuf’s arrest. “Spoke to Home Minister @rajnathsingh ji to look into Kamran Yousuf’s case. I’ve requested him to intervene so that the life of a young budding journalist doesn’t get ruined,” her tweet read.